Most people have a tendency to compare themselves to others, always wondering if they are as good as the next person. For some this is a more common issue, while there are other people who try to look inward to measure their success. 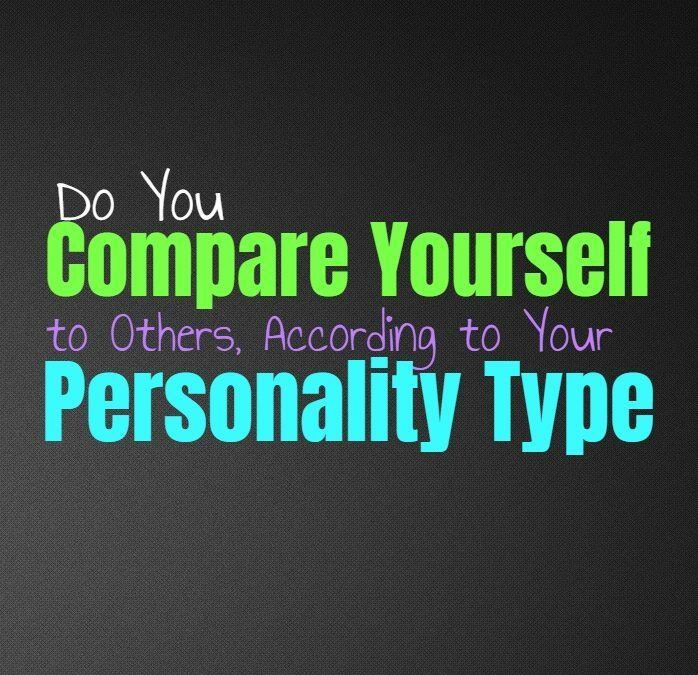 Here is how likely you are to compare yourself to others, based on your personality type. INFJs do often find themselves looking at the abilities of those around, sometimes comparing themselves. This is because INFJs can be rather hard on themselves, never really feeling like they are doing good enough. They feel pressures to accomplish their goals and always want to please the ones they love. INFJs definitely compare themselves to others, hoping to be as good as them and feeling internally competitive over this. It isn’t that they begrudge someone else their accomplishments, they just don’t like feeling as if they could be doing better. ENFJs can be rather hard on themselves, never feeling like they are good enough. They do compare themselves to those around them, trying to see ways they can improve and become better. ENFJs are naturally competitive people, but this is because they want to be able to impress their loved ones and make them proud. If the ENFJ feels as if someone else is doing a better job than they are, it can be something which weighs heavily on them and makes them feel like they are failing in some ways. INFPs can be somewhat hard on themselves, but they try to look inward for a measure of success. They don’t compare themselves to each person they see, but they may have some people they look up to and admire. When the INFP does meet people they look up to, they might be more inclined to compare themselves to these specific people. They have their own measure of success but can sometimes feel competitive wanting to be able to be someone that is good and talented. ENFPs do sometimes compare themselves to others, but this only happens in certain circumstances. Most of the time the ENFP focuses on doing their own thing, and prefers to be independent in their choices. ENFPs often measure success internally, not wanting to constantly look to others to see if they are doing things right. They might have moments when they see someone who appears more successful at their age. INTJs don’t like comparing themselves to others, instead they want to measure their accomplishments internally. They are often in competition with themselves, rarely finding people they believe are skilled and accomplished enough to really match them. INTJs would rather not become obsessed with comparing themselves to those around them, instead they want to be able to continue growing no matter what. For the INTJ it is important to continue to grow and remove ignorance from themselves and others, and for them this is the only thing worth comparing. ENTJs don’t really like comparing themselves to most people, unless it is someone who is far more successful than they currently are. ENTJs often want to really push themselves to be capable and highly accomplished people. They have many goals and as they advance they only continue to place even more impressive goals for themselves. This does sometimes cause the ENTJ to be in competition with others, but only the ones who have done impressive things far above where the ENTJ currently are in their lives. INTPs don’t really like comparing themselves to other people, instead they want to focus on their own internal thoughts and minds. INTPs are much more independent people who want to focus on doing things their own way. There can be times when they compare themselves to others, but this is often when they spend too much time analyzing and thinking things over. When they analyze something for too long it can cause them to second guess themselves, and compare their success to others. ENTPs want to remain more focused on their own actions and so they don’t compare themselves to just anyone. They might compare themselves to people they look up to and admire, but only these special people. ENTPs prefer to focus on growing and moving forward, without constantly needing to compare their choices to those around them. They often have their own path they want to follow and so they don’t need to look to others for this all of the time. ISTJs do sometimes compare their own choices and success to others, since they can be rather competitive people. They want to be able to move forward and continuously progress towards the futures they want. ISTJs care about being able to accomplish their goals and do whatever it takes to impress those around them. They certainly can compare their actions to others, especially when they are feeling competitive towards them. ESTJs can be competitive people who believe in moving forward and progressing towards their goals. They want to feel like they are as good or better than those around them when it comes to getting the job done efficiently. They do compare themselves to others because they want to be sure they are doing everything to keep improving and so this comes from their more competitive side. ISFJs do sometimes compare themselves to others, but this isn’t always on purpose. They care about being accomplished and want to be someone that their loved ones are proud of. Because of this the ISFJ sometimes struggles to feel like they are doing well enough, and so this causes them to compare their own actions to others. They care about making their loved ones happy and want to do everything they can to leave them feeling impressed. ESFJs do sometimes compare themselves to others, because they want to be able to accomplish their own goals and the goals that are often placed on them. ESFJs just want to be able to make their loved ones proud, no matter what this means for them. They put a lot of pressure on themselves because of it, and so they do sometimes feel this need to compare themselves to others. ISTPs don’t like comparing themselves to others, since they don’t like feeling pressure in this way. Instead they just want to work on getting things done and following their own path in life. Their sense of independent does often help the ISTP focus on their own goals, rather than a need to compare themselves to those around them. ESTPs do sometimes compare themselves to others, especially people they think have accomplished more than they have. They often appear rather independent and self-sufficient, but inside the ESTP can struggle with feeling competitive sometimes. They want to be accomplished and want to be able to reach their goals, but sometimes they can feel stressed when they are comparing themselves to those around them. ISFPs don’t really like comparing themselves to others, since they want to walk their own path in life. They would much rather focus on their own choices, and try their best to avoid feeling weighed down by expectations. When the ISFP feels as if someone they love is comparing them to others, it can actually be rather hurtful. They want to be their own person, and don’t want to feel pressure to be like everyone else. ESFPs are often independent people who focus on doing what feels right for them in the moment. They don’t usually compare themselves to others, most of the time they just focus on following their hearts in the right direction. For the ESFP being compared to others can be rather upsetting, since they want to feel independent from other people and their choices.